Now that last week we experienced the gourmet joy of a savory apple specialty, it’s time for something sweet. Apples by themselves are a tasty treat, and when you add extra yummy ingredients such as caramel – look out! – foodies will definitely fall for a dish like this. 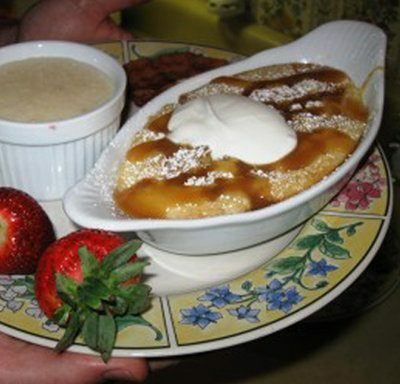 One enticing example is David’s Baked Caramel Apple Pancakes from our friends at Magnolia Springs Bed and Breakfast in Magnolia Springs, AL. At this beautiful inn, mornings begin with the sensational smells and tantalizing tastes of a hearty homemade breakfast. In the afternoon, guests relax with cool drinks on the wraparound porch underneath the majestic mid-day sun. Accommodations feature four guestrooms and the Harding Suite, which provides couples with plenty of opportunities to indulge in privacy and romance. Spray oval individual casserole dishes and place 1 tablespoon of butter in each. Place in the oven at 425 degrees for four minutes. Remove and add one layer of apples. Place back in the oven for five minutes. Add ½ cup pancake batter and sprinkle liberally with brown sugar. Remove and sprinkle with powdered sugar (light coating). Finish off with a dollop of sweetened sour cream. Serve with syrup on the table, but most don’t need it for it is wonderful without it!